It is time for Craft Lightning week again! 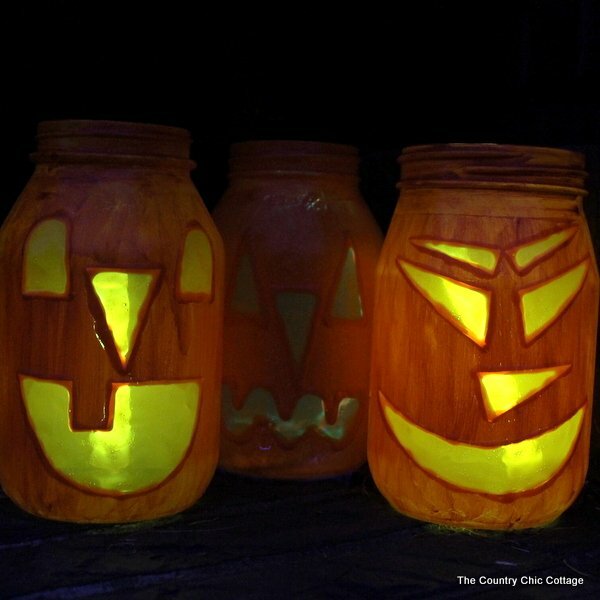 My Halloween jar luminaries are kicking off a week of crafts that take 15 minutes or less to make. Each morning I will post an original tutorial and each afternoon I will post a round up of great quick and easy crafts from our blog partners for this series. Speaking of blog partners, 30 Minute Crafts is my main partner in crime for this series so don’t miss any of her great quick crafts this week as well. This post is a part of my design team status with DecoArt where I am compensated for my participation. However all projects and opinions are my own. If you missed any of the fun this week, be sure to check out the round ups from day 1, day 2, day 3, and day 4. You will need various pumpkin eyes, noses, mouths, etc. 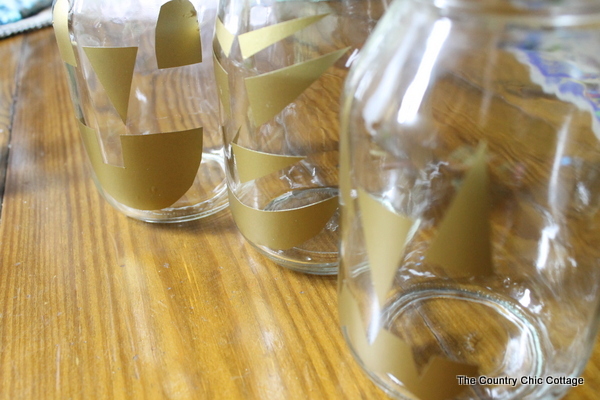 Cut them from the vinyl, contact paper, masking tape, or any thing else you can think of. 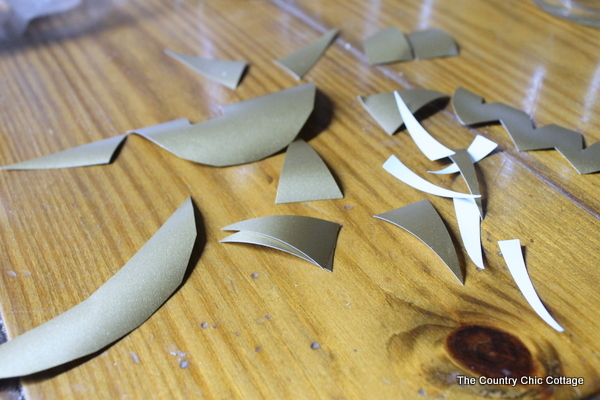 I used a craft cutter to cut my shapes but you can use scissors or a craft knife to do the job. 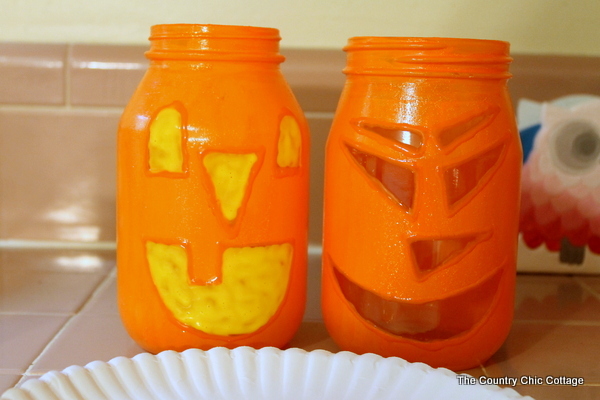 Let your kids apply the shapes to the jars in any way they like. Of course, you can do this job as well but this is a fun one to let the kids help with. NOTE: Clean your jars with alcohol before painting! You will need to do this after the stickers are applied as you do not want to touch the surface afterwards. 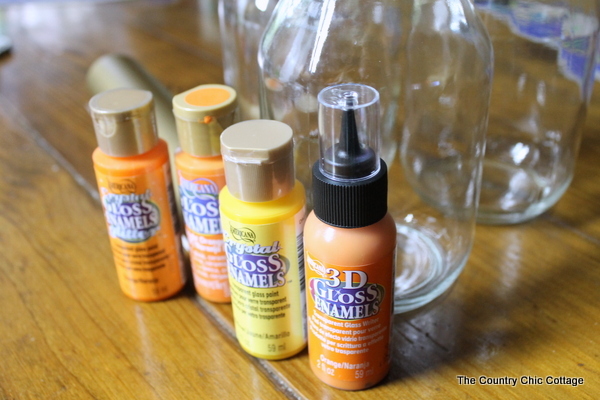 Apply two coats of the Gloss Enamels in orange to your jars allowing to dry in between coats. 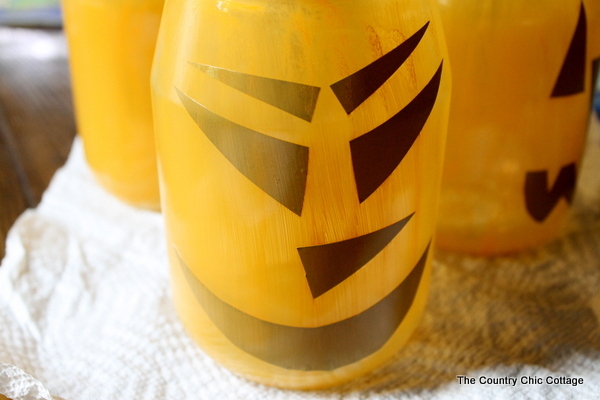 Apply a layer of Crystal Gloss Enamels Glitter in orange over the entire jar and allow to dry. Cut around all of your vinyl with a craft knife and remove. Then add the 3D Gloss Enamels Writer in orange around each opening. After this dries, fill each opening with Crystal Gloss Enamels in yellow. The Crystal Gloss Enamels will dry yellow but let the light shine through! 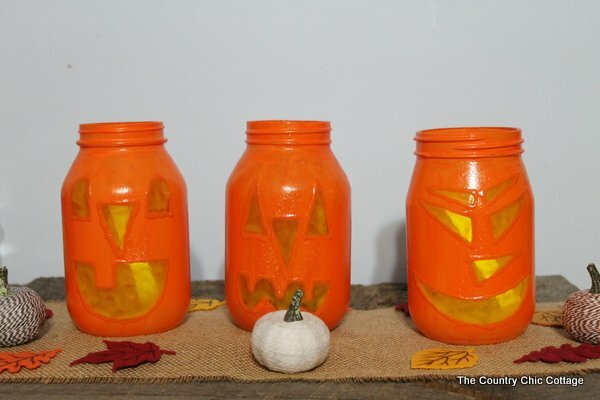 Add in tea lights or glow sticks to your jars to light up the night….or your mantel…. 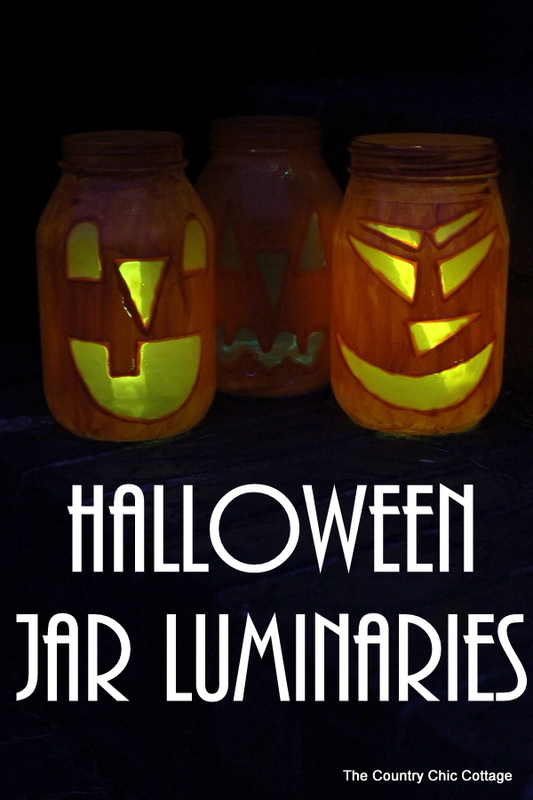 These are a fun way to light up your porch on Halloween night. Line a path to your door with these fun Halloween jar luminaries and make sure those trick or treaters know exactly which way to walk. Thank you so much for sharing all of your great ideas and absolutely fabulous tutoring.